The great Aussie icon - faithfully carried around the world by travellers from downunder - contains folate, which under a technicality, America allows to be added only to breads and cereals. 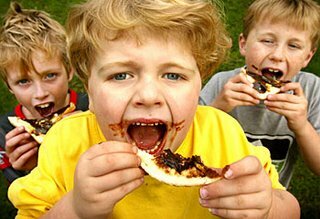 What morons the Americans can be - Vegemite, a well known product for 70+ years and tested on Australian humans for that long. This is a healthy product fools! Americans dont eat it anyway, right? Now, I have had Vegemite. We had an Australian nanny for a year who was kind enough to alert me to this outrage. I happen to think it is foul, but then again, she thinks peanut butter is foul. But searching Australian tourists for Vegemite? How is it we can profile Aussies for Vegemite and not young Muslim men for box cutters? Free the Vegemite now! This has been going around the blogosphere for three or four days now. Not only will Vegemite get banned, but also Marmite, from what I understand. And about these things tasting foul, I agree. After all, Vegemite tastes like it's made from oversalted dessicated vegetables, while Marmite tastes like it's made from oversalted dessicated marmots. How anyone ever thought of spreading these across buttered bread or adding to a stew, I'll never understand. I like Vegemite. For people who have soy allergies like myself, it's a good substitute for flavoring stir-fry. You can get Vegemite and Marmite at Wegman's. I better go and get some. When vegemite is outlawed, only outlaws will have vegimite. Will we also see imported copies of Men at Work's "Down Under" expurgated to remove the offending line: "He just smiled and gave me a Vegemite Sandwich?" GMT, I was just thinking the very same thing! Vegemite is made from the by product of the production of beer. We Aussies are so tough that we not only enjoy gallons of beer, in alcoholic strengths far greater than you Yanks, but we can also stomach the foul black sludge left behind in the process of making it. The ironic think is that Vegemite is manufactured by Kraft, a American company. BTW, I like vegemite. It is the anti-jelly. Claim: The U.S. has banned all imports of Vegemite due to the presence of folate.